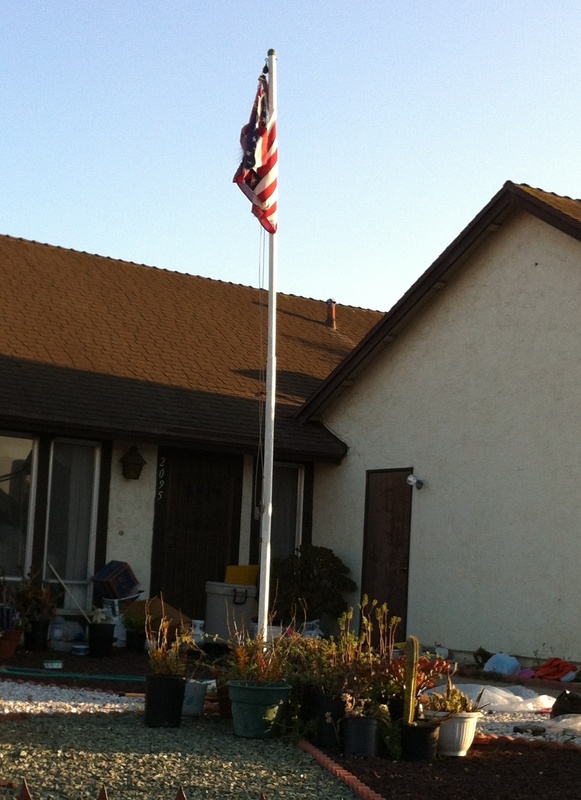 TODAY my 5 year old son and I walked to a house where a US Flag hoisted on a 16 foot flag staff; hanging faded, tattered and tangled on the pole. We knew and elderly Filipino lady lives there because we have been looking at this flag and its condition for sometime, we have seen her in her front yard on occasion. With a brand new polyester 3’ x 5’ with fully embroidered stars US Flag we approached the house, I saw the lady in her yard and thought what good luck, I don’t have to knock. With my son Zeke at my side and the flag in my had I said; excuse me maam, I would like to change your flag with this one if that’s okay with you. Me: There is no charge maam, I would like to give this flag to you and I would retire your old flag properly. Lady: No I’ve bought a new flay already and my neighbor will change it, he’s the one that always changes it. I bought a new flag and we change it on an anniversary. Me: Okay thank you for your time. I’m sorry whatever the anniversary; this flag has been like this for months and not only is it sad to see, but disrespectful to our flag, nation and those who died under the flag. When you have a US Flag displayed you have a responsibility to maintain it, and when the time comes, retire it respectfully and correctly.